Dynamic load QtAVWidgets in VideoOutput. QtAV::Widgets::registerRenderers() and QT += avwidgets is not requred now. D3D11 decoder support. Not stable on Windows phone. DXVA refactor and bug fix. Edit and apply custom shader when playing. Based on Qt property system. 0-copy is default for linux. VideoShader API is not stable now because I’m lack of shader experience. A custom VideoShader can be used through OpenGLVideo.setUserShader(VideoShader*). You can access OpenGLVideo through VideoRenderer.opengl() and GLSLFilter.opengl(). VideoShaderObject and DynamicShaderObject take advantages of QObject meta property and dynamic property features. It’s possible to dynamically edit and apply shader code when rendering using DynamicShaderObject. DynamicShaderObject is also used in QML as VideoShader type. A QML AudioFilter/VideoFilter can be type of AVFilter and UserFilter. VideoFilter can also be type of VideoFilter .GLSLFilter. AVFilter is the default type. The supported filters can be retrieved by supportedAVFilters property. The avfilter property is avfilter options. 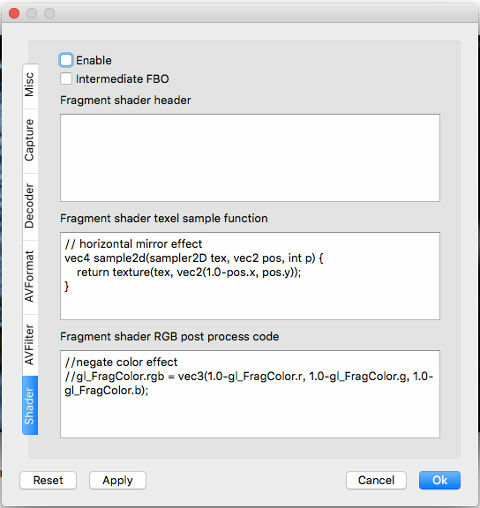 A VideoFilter can set a VideoShader as it’s shader property to use custom shader when GLSLFilter type is enabled.